Listed under Islands in Magelang, Indonesia. Java, the island of Indonesia’s capital, Jakarta, is the volcanic chain’s fifth largest island but has by far the greatest population with a whopping 124 million inhabitants. Once under the rule of the East India Trading Company, Java is a cultural melting pot, historically occupied by Indian Hindu and Buddhist kingdoms, then Muslim and finally European. 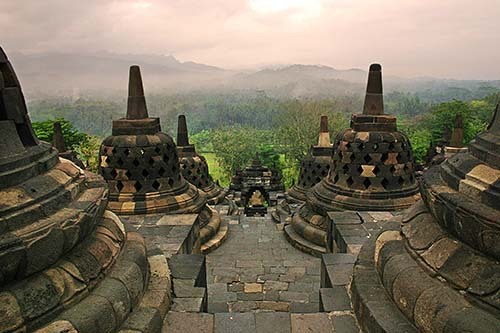 This historic blend of cultures means there are ancient temples and monuments in the style of many different religions and peoples, two of the best known being Borobudur, a Buddhist stupa and Prambanan, a Hindu temple complex. Aside from archaeologically interesting features Java has some of the world’s richest rice lands, some stunning tropical beaches and a spine of volcanic mountains running down it’s centre, some of them active and smoking (Mt. Bromo is famous for it. ), how’s that for a scenic backdrop. Though some rural areas are still relatively untouched, Java’s main cities, Jakarta and Yogyakarta are very built up and polluted and the gap between rich and poor is uncomfortably evident. For the best of local culture the areas around present day Yogyakarta and Surakarta are the most closely linked to their heritage and are the best places to see the classical Javanese arts of Wayang (puppet shows) and Gamelan (music. ).